Have you written your Essay yet this year. There is no time like the present to get started. It isn’t as hard as you may think. And, this year you get 100 words instead of the 50 we had in the past. 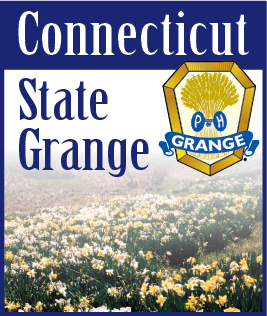 This year’s title is “What The Grange Means to Me.” And while you are at it, why not write a letter to a service man or woman in harms way. If you don’t have an address, send it to me and I will send it over along with others. Many of these go to Chaplains who distribute them to those who do not receive mail from home. It is hard to believe that soldiers, sailors, airmen and marines can be sent to Iraq and Afghanistan for a year or more and never receive mail from home – but it happens. Let’s do our part to let them know we care. Now is a great time of year to get outside and take pictures. You don’t need a fancy new digital camera to enter our Photo Contest. I still use film in my camera. You can too. More on the photo contest next month. I’m getting out again. I was in four different Pomonas in four days a week ago ---See you around the State.